While planning this post, I realized I had no idea where or how food preservation began. I started exploring its history and read that although food has been preserved for millennia — from early man having to harness nature to survive i.e. storing fish on a bed of ice — it was a French confectioner in the late 1700s who invented the canning techniques we still use today. In an article by the National Center for Home Food Preservation, I learned that Nicolas Appert discovered how applying heat to food in sealed glass bottles preserved it from deterioration. He theorized “if it works for wine, why not foods?” The French Navy later offered itself as a guinea pig for Appert’s principles, and in 1806 they were successfully trialled on a wide range of foods including meat, vegetables, fruit and milk. Rosella, or Wild Hibiscus, Jelly. Canning jars come and go quickly in our shops. If I see them, my inner Amish housewife is elbowed aside by my Black-Friday-Sales housewife and I’ll try and grab the lot. That said, we give many away as gifts, so there are times when we have to make do with reusing our old jars. Often the lids are compromised — the seals give way, or they rust — and if I’m unsure, especially in our searing summer months, I’ll store our preserves in the fridge instead of the pantry. 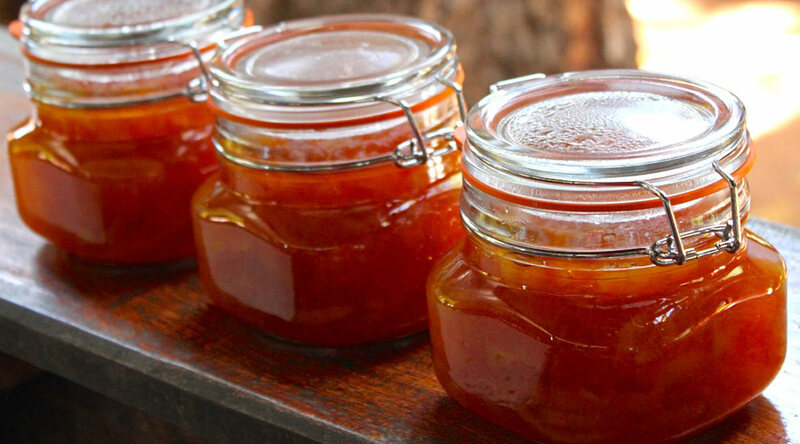 In this post I have highlighted some of the preserves we’ve made in the last couple of months. These include Rosella Jelly, David Lebovitz’s Kumquat Marmalade, Pilipili-Hoho, Pomelo Preserve, Roasted Peppers in Garlic OIive Oil, and Whole Preserved Kumquats. I have not included my Preserved Lemons or Marula Jelly, both of which I wrote about in earlier posts this year. Wild rosella, referred to by the Lozi people as Sindambi. Rosella seedpods, which help the setting process of the jelly. Rosella calyxes, which give the jelly its deep red color. Transfer the seedpods to a heavy-based saucepan, cover them with water, and bring to the boil. Turn down the heat and simmer the seedpods until they are soft, about an hour. Remove from the heat, strain the pods, and save the liquid to pour over the rosella calyxes in a separate saucepan. The seedpod water should just cover the rosella calyxes. Bring to the boil and then simmer until the calyxes are soft and breaking apart, about an hour. Remove from the heat, strain out the calyxes, and save the dark red liquid to measure its volume. Add an equal amount of sugar to liquid: 1 cup of calyx liquid = 1 cup of sugar. Remove from the heat, cool slightly, and transfer to sterilized jars. Click here to read how I sterilized jars when I made guava jelly last year. Rosella jelly and camembert on homemade ciabatta is a favorite combo. I have used this recipe a few times to make Kumquat Marmalade. In taste it’s unbeatable; in consistency I find it a little runny. To help this last batch set firmer, I added some big chunks of pomelo skin, which is packed with pectin, and it made all the difference. After it had done its job, I removed the pomelo skin from the marmalade. Click here to read the recipe. Kumquats just picked off the tree outside our kitchen. Cooking the kumquats and lemons with pomelo skin, the latter of which I later removed. I wrote about Pilipili-Hoho in one of my first posts on SavannaBel. It’s a hot, boozy sauce I add to soups, stir-frys, curries, and sautéed chicken livers, especially in the colder months. It’s bright and cheerful looking, and also makes a terrific holiday gift. Click here to read the post and the recipe. Our chillies have started producing all year round, although summer is when they really thrive. Chillies preserved in gin or vodka … a condiment we call Pilipili-Hoho. The pomelo, aka shaddock, aka pampelmousse, aka Chinese grapefruit makes a chunky, mild and moreish preserve. We have juiced pomelos, and eaten them fresh for breakfast, but I’d never cooked this football-size fruit before. The pectin is in the pomelo’s skin and dense pith, while its flavor can be found in the coral-pink segments. Click here for the recipe I adapted to make my Pomelo Preserve. I say “adapted” because I didn’t follow the recipe word-for-word. I never chopped up the whole fruit in a processor, for instance; instead I set the pink pulp aside and separated some of the skin from the pith, which I sliced neatly into thin strips before boiling. I also added 2 cups of water to the fruit and sugar mix before boiling it into Pomelo Preserve. I use the rind and dense pith of the pomelo to aid the setting process. The coral-pink flesh makes for a thick, brightly-colored preserve. When we were given a bagful of red, green and yellow peppers by a farmer next door recently, I knew we couldn’t eat them all so chose to roast and preserve them in garlic and olive oil instead. I did not use a recipe as such. I sliced the peppers neatly, removing the seeds and the ribs. I then blackened the peppers’ skin in a hot cast-iron skillet, which one can do in the oven or over a flame if it’s easier. I did this in batches because of the quantity. When the peppers were charred and softened, I transferred them to an airtight bag to sweat. When cool enough to handle, I peeled off the blackened skin, layered them in a canning jar, covered them with olive oil, added a couple of fine slices of garlic, and sealed. That was it. Done. Once opened, I kept the peppers refrigerated. We ate them in frittatas, in salads, in quinoa, and on their own. In this house roasted peppers don’t last long at all. When the peppers were finished, I used the leftover sweet-perfumed, smoky garlic oil to enhance a dish of roasted vegetables, as well as a salad dressing. Roasted peppers after blackening the skin in a skillet over the gas hob. Roasted Peppers in Garlic Olive Oil. Whole kumquats in syrup make a delicious accompaniment to cheese, especially a gorgonzola or Stilton. They are also complemented by roasted nuts, like almonds or pecans — some people stuff them inside the preserved kumquats — and can be used in cakes, steamed puddings, or ice cream. While preparing these kumquats I was left with a surplus of syrup, which I decided to bottle as a cordial. Kumquat cordial adds a warm citrus flavor to a hot whiskey, yet is also refreshing when topped with soda water, ice and a sprig of mint. Click here for the recipe, taken from an article in the Fresno Bee published in 1971. Tenderizing the kumquat skin in sugared water. Thank you for the history lesson at the beginning of the post. I look forward to making the Hibiscus and pilipili-Hoho jellies. You could be a home ec teacher! Oh I want to make the kumquat one. Haha, Michelle! I don’t think so … I’m not very good at following rules! That said, I’ve been asked to introduce some cooking classes around here so you never know … 😉 We’ve had such a huge harvest of kumquats off this one little tree, so this coming week I’m going to make those pecan kumquat tarts about which you wrote in a recent post. They looked and sounded so good! Strange question now, but I think you would be the one to ask…..What are the best things to see and do in Livingstone. (Apart from the obvious!) My friend is coming for a wedding, but she always likes exciting and educationl stuff to do. I suggested the Museum, Game Park, of course the Falls and Craft stalls, but what would you, as a local, wouldnt want us to miss? LOVE YOUR BLOG. We grew up on the airport Road opposite the hospital, and I STILL miss Livingstone. We had a Mugongo Nut in the garden, and it brought back such memories, like when elephants spent a day in the David Livingstoen school playing fields. All the various departments were called in to decide what to do, when a little Fox Terrier rushed, in yapping at their heels, and they took off, tails curled over their backs in fear of the little white peril. Through the Grave yard, down the road and back into the bush. Great place to grow up.